Here it is, finally! 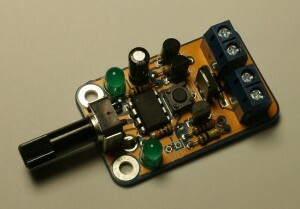 The12V Dimmer Kit V2 is now available. You can buy one in my on-line store for only $14.95. They are also available from BG Micro in Dallas TX. What is a 12V Dimmer Kit V2, you ask? It’s an especially efficient PWM (pulse-width modulation) controller for 12V loads up to 60W. Use it to variably dim LEDs or control the speed of DC motors. It comes as a kit and you solder it together. Have a look at the User Manual and Assembly Instructions (1MB PDF). I’ve also got a schematic diagram available for your inspection. The source code for the microcontroller is also freely available, if you’d like to tinker around with its innards, or just take a peek. The 12V Dimmer Kit V2 is both new and improved. “How can it be both?” you ask. I’m glad you asked. This is a redesign of of my previous 12V Dimmer Kit and includes several improvements in both the hardware and the software. I’ve also added some completely new features that were not present in the original kit, so that makes it new as well. See? Aren’t you glad you asked? This kit started out as a simple dimmer for one of my IR Spotlights. A customer in the UK wanted to photograph bats at night and needed a variable infrared source for his camera. I built two of those dimmers and they worked well for the intended purpose, but I was never really sure how well it would work in other applications. Another customer showed me a kit he was buying from overseas and I thought I might try making my own. It worked pretty well at about 25W and sold out every time I built a batch of them. Unfortunately, I had designed in a component that was once cheap & plentiful in the surplus chain but one day ran dry. It took a long time to find an adequate replacement that I could count on. Once I did, I sat down and started designing the new version, hoping to basically duplicate the success of the previous circuit and make a couple of small improvements while I was at it. Then yet another client wanted a custom version of the dimmer that was operated by a simple push button instead of a dial. I could get so much work done if it wasn’t for these pesky customers! (tee hee hee) The push button version worked well enough, and it made me want to add that as a feature to the existing dimmer kit. That was kind of tricky! The upshot is that the new (and improved!) 12V Dimmer Kit V2 will work with either the dial adjustment (a potentiometer) or the push button – or both. I also wanted to up the power-handling capacity to at least 50W. I added an extra amplifier stage to the output driver, and was able to get the new kit to handle up to 60W without a heat sink on the output transistor. It gets a little warm but not much (i.e., you can leave your finger on it). Thanks to all my beta testers for helping me test the unit in the field, point out obvious bugs and even blow units up. Your help and attention to detail (and abuse of poor, innocent electronics) has made this a much better product than I could have possibly made by myself.